Setting up your Cloud Camera is easy; just plug it in! Zero Configuration makes it easy to set up your D-Link Cloud Camera. Simply connect it to a mydlink-enabled Cloud Router - that′s it! Your camera will automatically appear in your mydlink account the next time you sign in. Set up a multi-camera network in minutes! Instead of setting up each camera individually, just connect all your Cloud Cameras to your mydlink-enabled Cloud Router to automatically configure them. No networking knowledge is required; mydlink does the work for you. 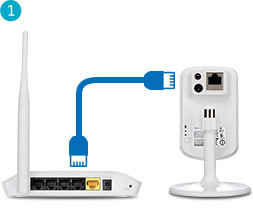 Connect the Cloud Camera to your mydlink-enabled Cloud Router with an Ethernet cable, or with WPS instead. 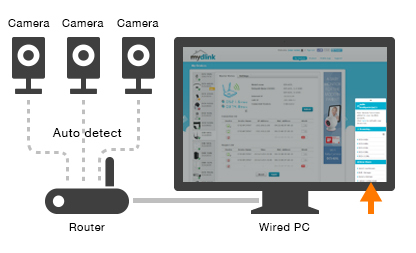 Go to the mydlink website, click on the new device notification, and add the camera to your account. Your camera is now configured, and you can view it from your PC or mobile device!